Wondering what to see in Santa Fe? There is so much to do! That’s why it’s been rated one of the top cities in the United States by a variety of outlets, such as Travel + Leisure and Conde Nast Traveler. 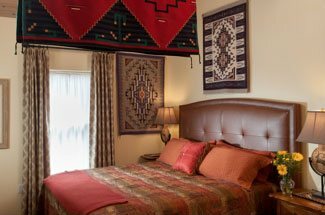 From shopping in Santa Fe to enjoying some of the best restaurants in Santa Fe, you will find a variety of activities and attractions to keep you entertained and excited during your vacation at Four Kachinas! However, with so much to do, planning your itinerary might be a little overwhelming. Not to worry! We’ve got you covered on what to see in Santa Fe during your New Mexico getaway. This list could go on for quite a while, but we’ve just chosen 8 of the best places to see! If you’re an art aficionado, then a necessary decision for what to see in Santa Fe is the Georgia O’Keeffe Museum. With stunning floral and skull combinations, some of O’Keeffe’s most riveting creations are on display at the museum. However, you will also get an insight into the life of O’Keeffe herself, along with the landscapes that inspired her during her time visiting and living in New Mexico. When deciding what to see in Santa Fe, don’t pass over Canyon Road on the itinerary. 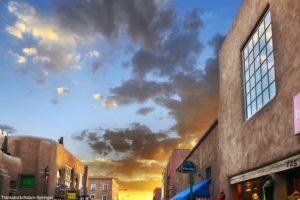 Featuring over 100 galleries, boutiques, and restaurants in a half-mile stretch, Canyon Road in Santa Fe, New Mexico, is a magical destination. Nestled in the foothills of the Sangre de Cristo Mountains, this art mecca has been around for a century, and will keep you entertained for a whole morning or afternoon! The Museum of International Folk Art is another attraction not to be missed when planning what to see in Santa Fe. The variety of exhibitions featured will pull out the inner art lover in just about everyone, from The Morris Miniature Circus: Return of the Little Big Top to FLAMENCO: From Spain to New Mexico. The Loretto Chapel is a wonderful attraction to visit when choosing what to see in Santa Fe. The mysterious staircase in the chapel is an enthralling feature; the way it was constructed is still speculated to this day. The historic artifacts relating to its life as a Roman Catholic Church are interesting to soak in as well during your tour. The Wheelwright Museum of the American Indian is the oldest non-profit, independent museum in New Mexico. If that’s not reason enough to visit, get enticed by the unique contemporary and historic Native American art that awaits, including a museum shop with antique jewelry, ceramics, and textiles. The San Miguel Mission is an ideal historic stop when planning what to see in Santa Fe. As the oldest church in the United States, this mission built above an ancient kiva, has inspiring architectural elements, beautiful religious art, and a continuing legacy as it is still in operation as a church. What to see in Santa Fe? Why, the Santa Fe Plaza, of course! In the heart of downtown, the Santa Fe Plaza has been a staple for almost 400 years, serving as a central part of the community. Here, you will find Indian and Spanish markets, along with annual events and concerts. El Rancho de las Golondrinas will take you back in time. This living history museum covers over 200 acres and features original colonial buildings, on-site weavers, and many festivals and weddings throughout the year. 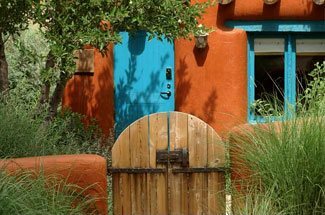 After exploring one (or a few) of these suggestions as to what to see in Santa Fe, come back to your favorite downtown bed and breakfast, Four Kachinas. Get a great night’s sleep in a historic room and then wake up to some delectable breakfast in the morning before embarking on more Santa Fe adventures. For more information on what to see in Santa Fe, download our free vacation guide!